There are few parts of a hog that don't respond well to curing, from its meaty jowls -- the storied "guanciale" your deli charges so much for -- to crisp bacon and juicy hams. If you love the taste of these porcine treats but can't bring yourself to indulge in anything so fatty, a lean peameal bacon roast might be the compromise you're looking for. It's what most Americans think of as "Canadian bacon," but cooked as a single piece rather than in slices. This cut is known by several names, though "Canadian bacon" is the most common throughout the U.S. It's the lean pork loin, cured with salt, sugar and spices and sometimes smoked as well. Canadians seldom use the term "Canadian bacon," referring to the cut as back bacon if it's pre-cooked, and ready to eat or peameal bacon if it's rolled in cornmeal and sold uncooked. It can be sold in ready-to-eat or uncooked form in the United States, depending on regional preferences or the individual producer. In either form, it can be thought of as a lean, compact, quick-cooking ham. 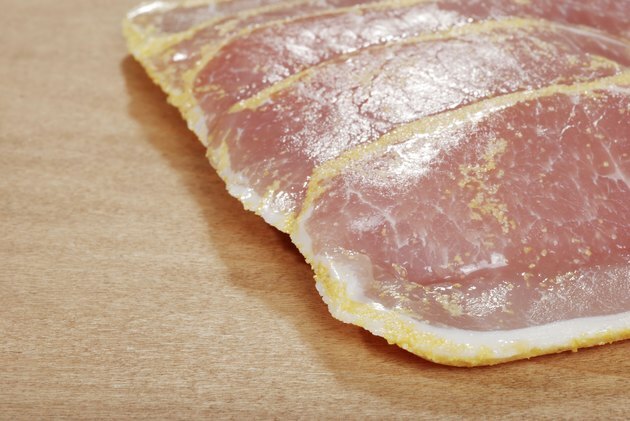 If your peameal bacon roast is labeled as "ready to eat," that means it's fully cooked and can be sliced and eaten without any further preparation, just like a fully cooked ham. These are quick and easy to put on the table, requiring just 20 to 30 minutes of reheating time. This is long enough to glaze the roast, if you wish, with tart fruit preserves or a sweet coating such as maple syrup, honey or agave nectar. Heat the roast at 400 degrees Fahrenheit in a covered pan with a small splash of water, wine or apple juice for moisture, uncovering it for the last 10 minutes if you have a glaze to caramelize. An uncooked peameal bacon roast takes longer, usually about an hour at 325 F. The very lean flesh is prone to drying out if it's overcooked, and most brands remove the protective rind of fat that would ordinarily protect it from the oven's heat, so it helps to use a small amount of apple juice, wine or cider in the roasting pan. Cook the roast to an internal temperature of at least 145 F, the same as any other piece of pork, to ensure food safety. If you want to glaze the outside of the roast, turn up the oven to 450 F and let it heat while you brush on the glaze. Return your roast to the oven for an additional 10 minutes, long enough for the glaze to brown and set. Use peameal bacon as a healthier alternative to ham and other pork products, for festive meals or just when you feel like indulging yourself. Cured meats are never entirely guilt-free, thanks to their high levels of sodium, but peameal bacon comes closer than most. It has a fraction of the fat and saturated fat you'd get from conventional ham or bacon, and is lower in salt as well. Can You Eat Bacon if You're Trying to Lose Weight?